What is Pioneer Pet Raindrop Filtered Drinking Fountain? When your pet is thirsty you don't want him or her drinking out of a bowl that could be filled with bacteria. That's why the Pioneer Pet Raindrop Filtered Drinking Fountain is a great addition to your household. The Pioneer Pet Raindrop Filtered Drinking Fountain is an electric stainless steel pet fountain with a raindrop shape that is easy for pets to drink from. Since it's made from stainless steel, bacteria doesn't have a chance to build up. Plus the circulating water movement makes it more appealing to your pet. The Pioneer Pet Raindrop Filtered Drinking Fountain comes with a charcoal filter which continues to provide fresh, bacteria-free water to your pet. The Pioneer Pet Raindrop Filtered Drinking Fountain is available in 60 oz and 96 oz, so you don't have to worry about refilling all the time. The next time your pet needs a drink, just fill up the Pioneer Pet Raindrop Filtered Drinking Fountain in either the 60 oz or 96 oz size, plug it in, and switch it on. 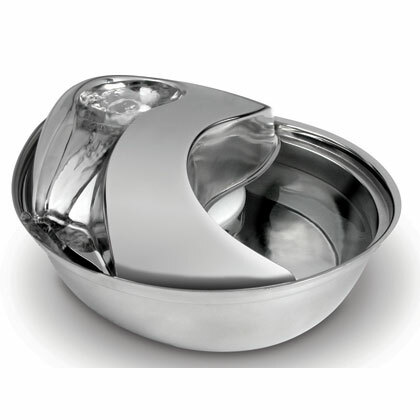 The stainless steel helps keep pets safe from bacteria that is known to build up in ordinary water bowls. The charcoal filter circulates the water so your pet is always lapping up fresh, clean water. The raindrop shape is sleek and compliments most home decor. The Pioneer Pet Raindrop Filtered Drinking Fountain is dishwasher safe. Unplug the Pioneer Pet Raindrop Filtered Drinking Fountain when you are away for extended periods of time. For complete assembly instructions, see the Pioneer Pet Raindrop Filtered Drinking Fountain Manual. Introduce the pet fountain to your pet by placing it in the same spot as his or her ordinary water bowl. The Pioneer Pet Raindrop Filtered Drinking Fountain is great for pets that don't drink a lot, and those with urinary issues. For optimal performance clean your fountain once a week and disassemble and clean the pump once a month. Details: Made with stainless steel. Available in 60 oz and 96 oz.